The classic tale of manipulation and jealousy in a contemporary military setting. Iago (Danforth Comins) is a jealous SOB and he does his sniveling darnedest to undermine his superior, a man of color, the Moor, Othello (Chris Butler). He does so by conceiving a dastardly plot to make Othello jealous of his new wife, Desdemona (Alejandra Escalante), and a young officer named Cassio (Derek Garza). Iago’s wife, Emilia (Amy Kim Waschhke), also the devoted handmaid of Desdemona, gets caught up in things semi-unwittingly. As with all Shakespeare tragedies, things get pretty skeevy. This production, brought from the Oregon Shakespeare Festival, contains a lot of anguished shouting right from the outset. It is not generally what one would call a nuanced approach, but is rather a heavily kinetic and right out-there kinetic take on this great, difficult classic. The contemporary Navy becomes the setting, and there are a lot of modern-day sight gags: cell phones, flat panel TVs, a weight room. The result is kind of trendy, but these modifications don’t necessarily enhance the basic drift of the play. Generally the acting is quite broad, which is clearly the intention of the director. There are moments of quiet seething, but mostly there is a lot of gnashing of teeth and wrenching of guts. Chris Butler’s Othello comes on initially with a dignified elegance, quite convincingly, but the tone varies quite a bit as the performance continues. Part of the challenge of any production is that the play itself leaves certain gaps that need to be filled in by a lot of psychologically deft actors; for a more kinetic production, as is the current one, some of that density invariably gets lost. Butler carries some of it as the jealous rage begins to build. In the end, his performance is more like a daunted Lear wandering in the wilderness, quite disoriented, distracted, and forlorn. It’s an interesting take on the role but it compromises intensity for a sense of psychological dissociation. 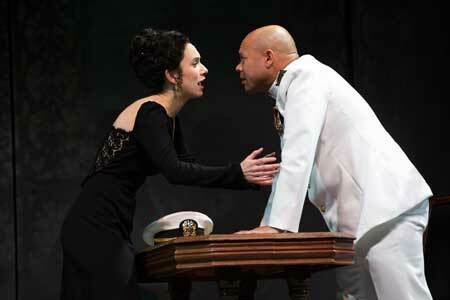 Alejandra Escalante’s Desdemona is affecting enough and her appeals to the ever-darkening Othello seem reasonably conveyed. Danforth Comins’ Iago manages to depict the duplicitous rogue decently, doing so with a deliberate attitude, one actively geared to carrying out his mission, rather than a portrayal with a constantly sneering disposition. From the performance we don’t exactly get why Iago has such antipathy for Othello, but the play also leaves enough of that to the imagination to require extrapolation by an actor to give a vivid and visceral sense of the subtext. Certainly the anti-immigrant sense from recent national political embarrassments are enough cause to bring this sort of racist manipulation to mind and Comins’ Iago fits well into that mold of villainous prejudicial rage. As the Cassio in this production, Derek Garza, comes across as something of a dork, which seems a little odd, especially for a character who’s got to fit into the dastardly Iago’s romantic triangle sting. A certain amount of ART-typical production gadgetry is employed in the sleek set design by Christopher Acebo, with the death-bed and any other number of things arising from a center-stage lift. Along with the every changing flat-panel TVs, it’s kind of engaging but a bit more technology than the production seems to really need. Overall: Some interesting interpretations, but a little too exorbitantly extroverted an approach to capture some of the more insidiously subtle psychological nuances, particularly in Othello and in Iago.